-tools designed to stimulate and facilitate large group conversations and interactions. We build engagement into your event. MtgWorks™ puts information and easy to use, interactive tools into the hands of your delegates, connecting them. Tools and activities that capture their attention, and engage their participation. We listen to the room—at once. Conversation is a key to a successful event. Shared ideas can change the course of a meeting, a quarter, or a company. MtgWorks' Table Talk™ feature engages your delegates in small conversations that lead to big ideas that are shared with the whole room. 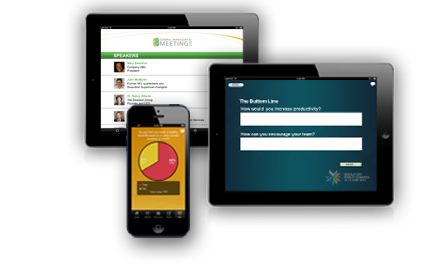 With MtgWorks™ advanced Audience Response, polling, and feedback tools, every voice is heard, every response captured, considered, and evaluated. We also elegantly collect text responses to your questions. We save trees and headaches. 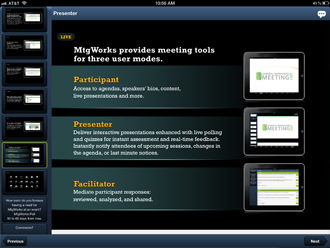 At a MtgWorks™ powered event, updatable agendas, bios, venue maps, and meeting resources are available in the app. Waste, printing, paper consumption, and outdated information are greatly reduced. The app is only a part of our story. We work with you, planning, designing, managing, and evaluating your MtgWorks™ powered event—before, during, and after the show. 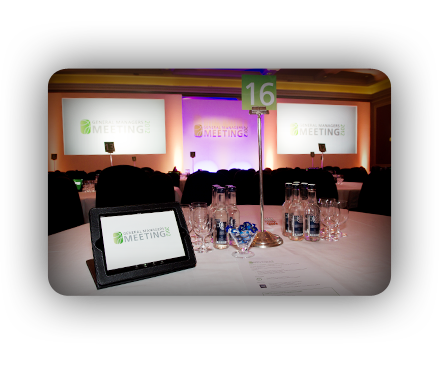 Our years of experience in the meeting room inspire every event. 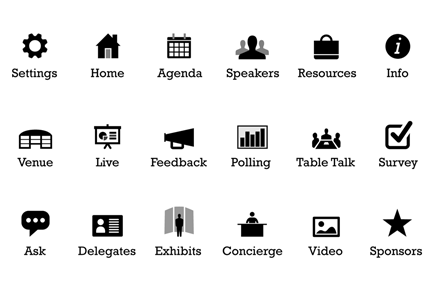 Table Talk™, advanced Audience Response, Presentation, and Paperless Meeting tools in the hands of the delegates—everything you need to engage your attendees. your brand, your meeting, and your messaging. We design and build your meeting with the features you need to effectively engage, communicate, and interact. All of the modes are included in MtgWorks™, select just the ones that will help you achieve your goals. Table Talk™ provokes conversations. 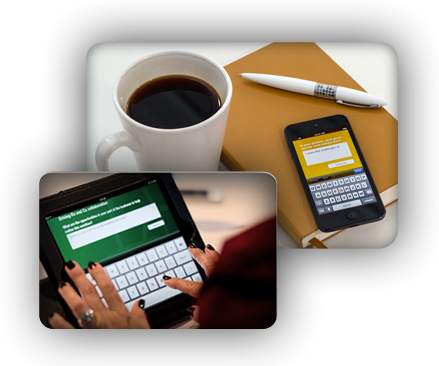 Delegate responses, ideas, and feedback, are captured, facilitated, and synthesized. Reponses can then be displayed on the main screens or iPads for further discussion. All attendee input is formatted into reports for review immediately after the session. Table Talk™ gives facilitators of large group interventions, the tools they need. For delegates engaged in a presentation. The Presenter controls what is seen on the iPad screens during presentations at an event. This role can be handled by a member of your team or by MtgWorks™ on-site staff. Facilitators review delegate commentary, feedback, and poll responses in real time. They can select individual responses, as well as isolate and highlight themes for meeting presenters and continued discussion. Editors review Facilitator suggestions and Participant responses. 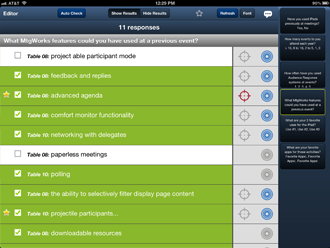 They select the responses to be displayed to the main screen and suggest topics for further group discussion. Each project has a different set of requirements, we understand that, MtgWorks™ is flexible. We provide turn-key solutions for events seamlessly providing content delivery, facilitators, full production kit, secure wireless network and show crew. Or, we can work with your iPhone, iPad, or iPod Touch, wireless networks and audio-visual production suppliers. 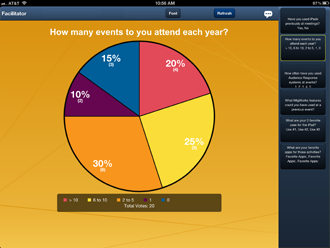 MtgWorks™ event support can range from a single audience response session to an entire meeting solution. We can securely network a dozen or hundreds of devices. MtgWorks™ was created from 30 years of innovative interactive and events experience. Our goal: to maximize the potential of your events. We focused on creating the right tools to engage your delegates, ease of use, flexibility in meeting creation, and on-site systems reliability. 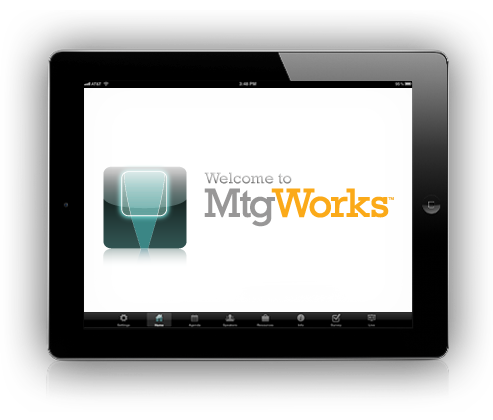 MtgWorks™ is available as a free download on the App Store. To fully use the app, you must be in attendance at a MtgWorks™ powered event. Please contact us for a demo meeting code.